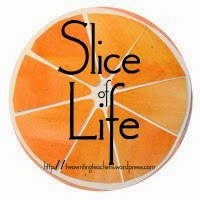 I'm slicing with the Two Writing Teachers community for Day Sixteen of Thirty-One of the Slice of Life Challenge in March. WE ARE HALF-WAY DONE! Congratulations to everyone who have made it this far! Thank you Stacey, Tara, Anna, Betsy, Dana, Kathleen, Beth, and Deb. 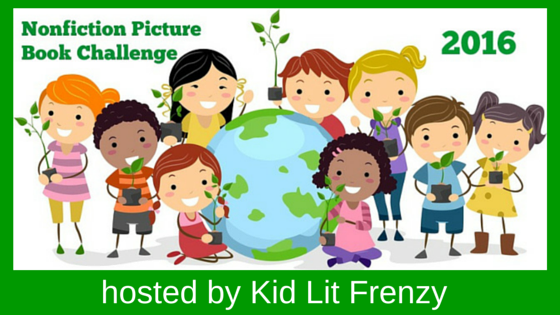 Because of this meme, I started reading more non-fiction picture books, and found they taught me as well as entertained me. 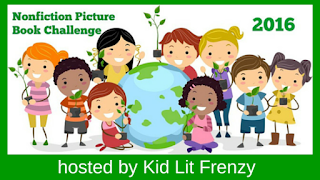 Hope you will find some great books for yourself as you read my post and others. I only have one book to share today, but it is timely, and some of you who link with Alyson have shared it too. I am not sharing my political views, saying that I will vote for Hillary. 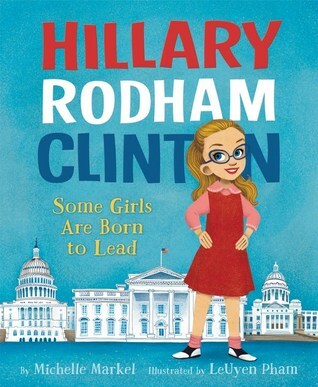 But I want to introduce this fabulous book by Michelle Markel that shows a bit of women's history in this Women's History Month, and shows how hard Hillary Rodham, then Hillary Rodham Clinton worked to help women find equality. From the text of the opening page: "In the 1950s, it was a man's world. Only boys could grow up to have powerful jobs. Only boys had no ceilings on their dreams." I grew up in those '50s, was one of two girls who enrolled in chemistry and calculus, was one of two who played trombone. I didn't know it wasn't okay, and the school did not discourage me, but we two were lonely. 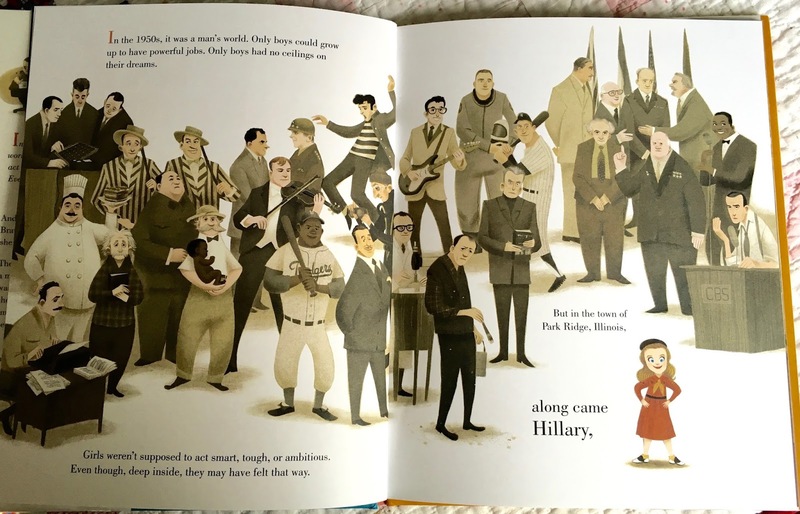 The illustrator, LeUyen Pham, has shown this so wonderfully, and worked hard throughout the book to show Hillary in all aspects of her life, depicting real and well-known people! There are graphics that identify the people included. In this first picture, you may be able to recognize many by yourself. The first page. Click to enlarge to view all those famous "men". Hillary worked hard in service in her church youth group, who worked to help poor people. This led to her seeing Dr. Martin Luther King where she heard the quote: "There is nothing more tragic than to sleep through a revolution." She was elected student body president at the East Coast women's college, and gave the first senior graduation speech ever. Before that speech, a senator spoke, and discouraged students from protesting (this, during the VietNam protests). Hillary gave her speech, but added in criticism of the senator. Bravely, she said: Fear is always with us, but we just don't have time for it. Not now." These early times showed Hillary's courage, trying to fight for what she saw as injustices, beliefs she has carried throughout her life. As the book chronicles the highlights, I have been amazed at her tireless fight for women and other groups who need support, are working themselves for better lives. 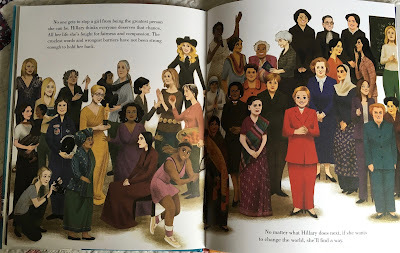 One of the ending pages, Hillary with many famous women. Click to enlarge! There is a timeline, an extensive artist's note showing who is shown with Hillary on each page, and a bibliography for further research. 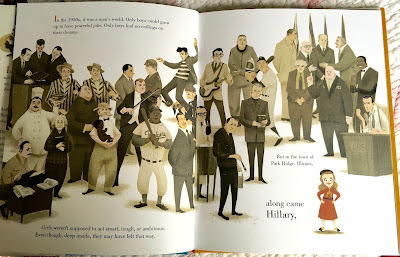 No matter your political preferences, the book is worth reading for the historical events Hillary has taken part in. I got to hear her speak here in Billings when she ran for President the first time. My favorite political pin of that time was a picture of President Bill Clinton and the button said "First Gentleman". My son and daughter-in-law are here visiting, and we were talking about him being in the White House again. Great souvenir. What a book! I fear it's still a man's world in many ways. But that picture shows the amazing history of women. Here's to more! Agreed, Julieanne. It may be a historical year this year! This book looks amazing! Thank you for sharing! What would we do without books! I know I would be lost, Loralee! It is not always about politics. Books give us a glimpse of a person that nothing else can. Yes, they do. This time, I was so thrilled with the added history that LeUyen Pham included in the illustrations. The political arena is heating up so fast and unfortunately it is distasteful how the slurs are being thrown. Thanks for shedding light on what we all love: books. You're welcome, Carol. At least they give us a chance to consider information without rhetoric. A beautiful book! They always are the answer, yes? A beautiful reminder that our politicians are people with stories too. Thank you. You're welcome, Kendra, I hope that the stories help us learn about the candidates so we can choose less emotionally. What an awesome book Linda! I too am not saying I will vote for Hillary, yet I have great respect for all she has done for women. If only the two parties could play nice, imagine the possibilities . . . if only! Thanks for sharing. Yes, "If only. . ." I am imagining a challenging rest of the year until November watching the news, Lynn. A great morning to share this book after a big night for Hill! I'm so glad it worked out this way too, Bonnie. What a crazy election year! Watching the American elections as a "foreigner" (hello from Canada!) has been a very sobering experience. There just seems to be so much anger, hatred and ignorance simmering below the surface, ready to boil over when provoked by bellicose politicians. As a child, I'm sure it must be confusing and bewildering, seeing all these supposed grown ups being so mean to each other! It's helpful to be reminded that there's more to politics than these terrible antics, and more to politicians than courting votes or stirring up trouble. I've heard from several outside the US who are bewildered, and I must admit that many of us are, too, Jane. I'm hoping that it gets more comfortable very soon. She has been a force to reckon with all her life. It will be interesting to see what happens in November. I now want the weeks to move more quickly, Elsie. This is already been enough brouhaha for me! I've kept it to re-read, Michele. I had to wait a while to get this bio, but am so glad I did. It is so rich and full of the history that surrounded Hillary. I have always had admiration for her activism and the depth of her beliefs. I'm keeping my fingers crossed for Hillary! And thanks for this book - a perfect choice for my school library. You're welcome, Tara. I hope you and others enjoy it. I still need to read this one. I've read several others, but this one looks really well done. I've only read the other one by Jonah Winter, which was good, but this includes so much more. I've seen this but haven't read it yet. The illustrations are gorgeous! I'd like to see more of Ms. Pham's works! Thank you for sharing this timely piece, Linda! You're welcome, Fats. I too love the illustrations, and the research done to make them authentic to the times is outstanding. Thank you for sharing this book! It is new to me and sounds like a must read. Hillary has worked so hard for so long. I was very impressed with all that was included. You're welcome, Maureen. You and Aly highlighted this one today, and I think it looks like the best of her bunch. Informative yet beautiful and entertaining. Agreed, Kellee. It is very good. Ooh, I love that first picture, Linda! You've convinced me to read this book and probably get it for my classroom! Oh, it would be a great one to share with your students, Jennifer. So many topics are included. This looks like a great book. I can't wait to check it out. Thanks for sharing this timely picture book. I hope you enjoy it, Cathy. Off to request this title and enjoy its pages. Thanks for sharing a timely book for the season and for Women's History month. Thanks for sharing this book. I too am not saying I will vote for Hilary, but I do like a good story!